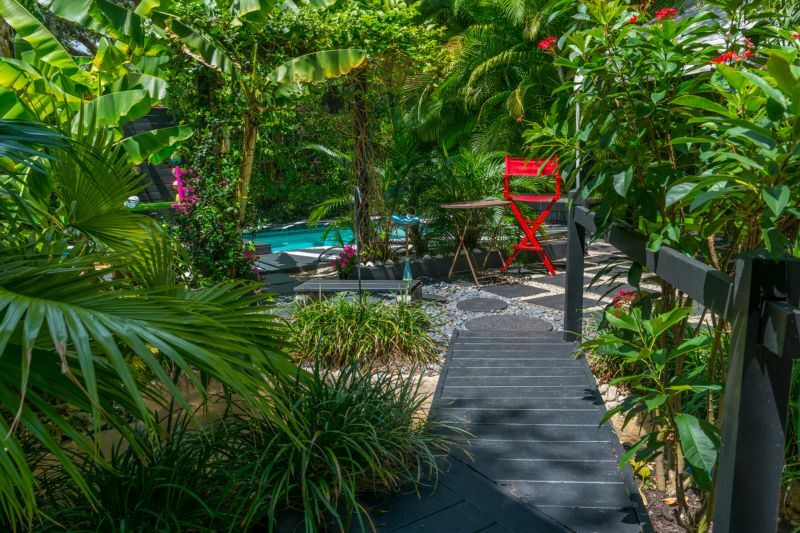 The small bridge leading from the house to the backyard pool terrace was painted black like the home’s floors, for a seamless flow from the interior to the exterior. Betancourt among their hundreds of art and design tomes. Betancourt, also born in Puerto Rico, was raised by Cuban parents who emigrated there, then moved to Miami when he was 14. A deep connection to the island that shaped his childhood is evident in his artwork, which explores issues of beauty, nature and memory. His inspiration is partially rooted in family photo albums that his mother created. “At times,” he confides, “it was pretty much the only thing we had left as we moved often. I am also intrigued by the memory imbued in objects and the attachment and nostalgia that they may evoke because of this symbiotic relationship.” Being a fan of history also influences his work, which is in important public collections including the Metropolitan Museum of Art in New York, the Smithsonian National Portrait Gallery in Washington, DC, the McNay Art Museum in Texas, the Palm Springs Art Museum and the New Orleans Art Museum, among others. His work has also been included in multiple solo and group exhibitions, as well as art fairs such as Art Basel and Arco. Inside the Art Deco fireplace is En La Arena Sabrosa 2003 (elements from a 7000 sand castle artwork installation by Betancourt), on the TV screen an image of Appropriations del Mar y Amor 2014, an installation which was a collaboration between Betancourt and Latorre for Gloria and Emilio Estefan’s restaurant, Lario’s On The Beach. To the right of the television is An Amulet for Light, XII, 2012 by Betancourt. 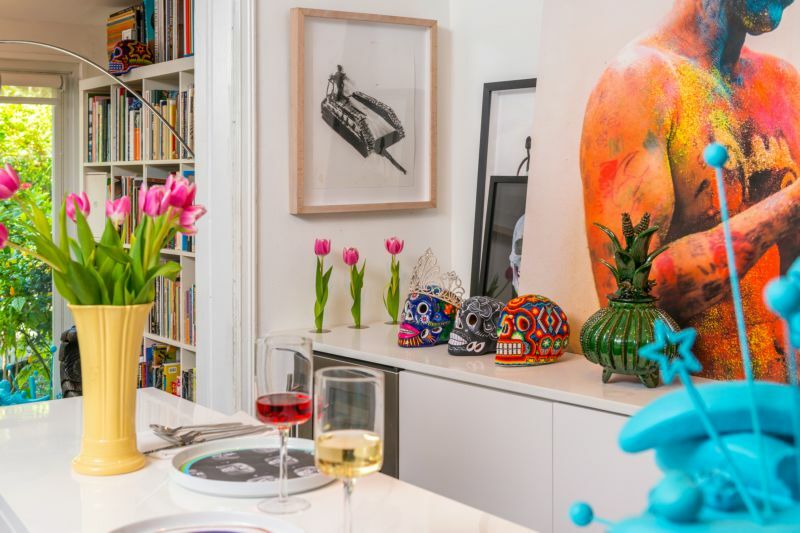 On the shelves are a collection of various artists’ work including Kahinde Wiley, Tomaselli, Arnaldo Roche, Rene Cox, Naomi Fisher, Jose Bedia, plus vintage toys and artifacts. Custom, shallow cabinets hide the sound system. 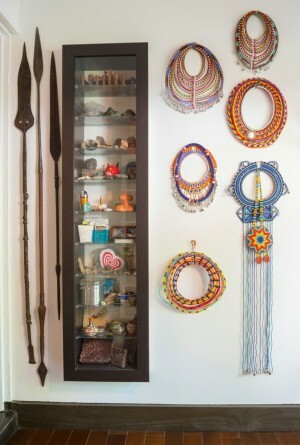 Colorful necklaces by the Masai tribes from Kenya hang next to Masai warrior spears. 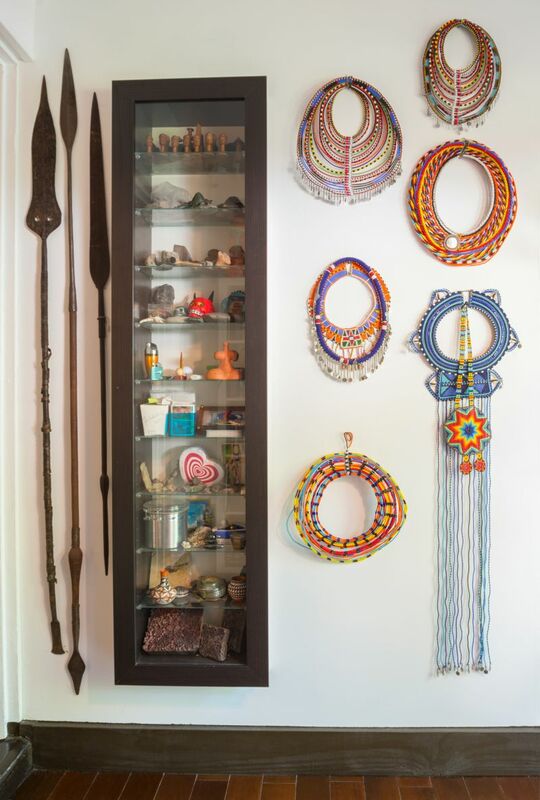 Inside the cabinet various indigenous Taino, Aztec and Pueblo Indian artifacts along with vintage objects and postcards from Miami Beach. 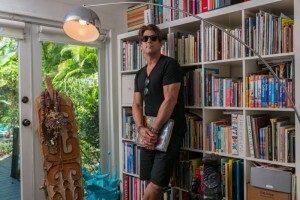 Latorre, also versed in visual arts, is a University of Miami School of Architecture graduate. He specializes in design and management of residential, commercial, institutional, parks and recreation projects as well as interior and furniture design. 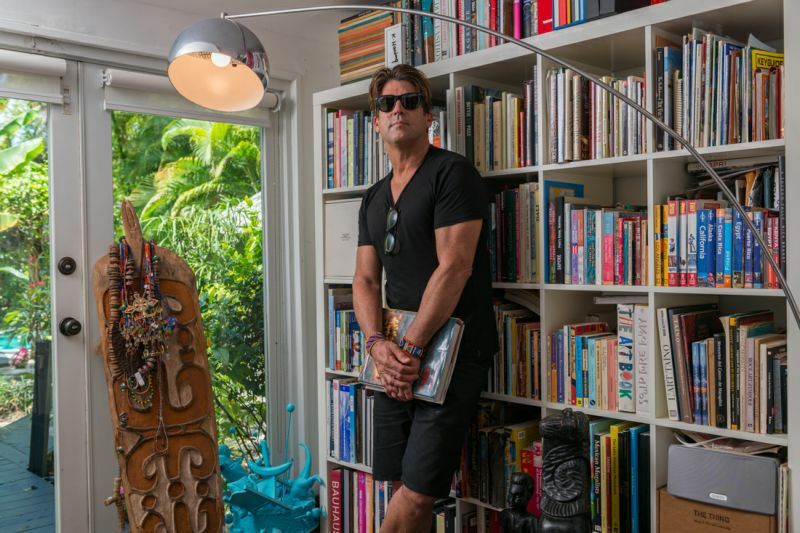 Latorre is Betancourt’s studio director and has collaborated with the artist on a variety of art installations, from site specific artworks for the exceptional contemporary artwork collection of Celebrity Cruises, to Miami International Airport, Zoo Miami and Miami-DadeCounty’s Animal Shelter; all commissions awarded by the Miami-Dade Art in Public Places Trust. They were introduced 18 years ago by mutual friend Richard Blanco, the fifth presidential inaugural poet of the United States (who also participated in the ceremony marking the formal reopening of the U.S. embassy in Cuba in August). With many longtime friends like Blanco, they entertain often as a respite from their intense, creative schedule and the frequent travel for work and inspiration. All the more reason this home needed to be the ideal sanctuary in which to stop, unwind and recharge. Original, vintage letters acquired from the historic National Hotel on Miami Beach when it was being remodeled, were re-arranged into a cheeky directive. The renovation was a significant collaboration between the two, outlined by Latorre’s analytical, problem-solving mind. “I had to invent new storage everywhere I could,” he says. “When I designed the furniture it was to create flow and continuation and give the appearance of more room. I tapered them and gave them angles to fool the eye.” Both are very hands on and have solid knowledge of construction. 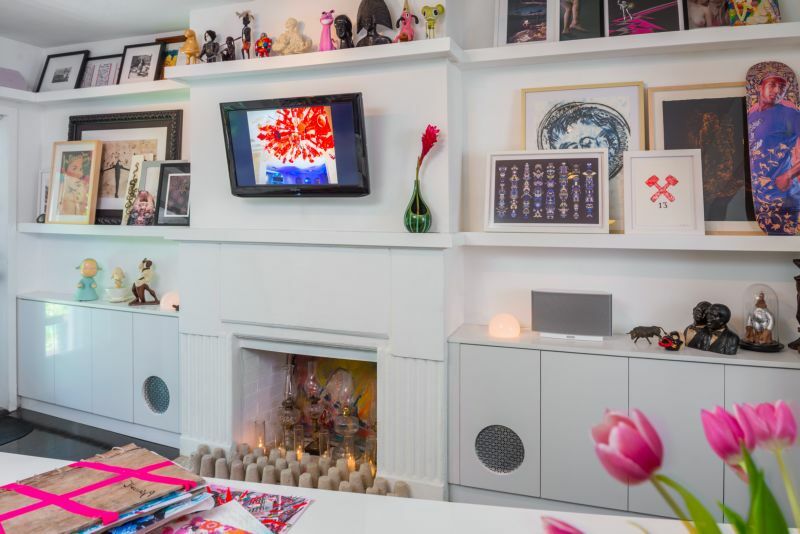 Shortly after buying the home five years ago, they dove in to add sophisticated elegance and function to the humble gem, which, in the style of the 1930s, was a warren of dark, claustrophobic rooms. 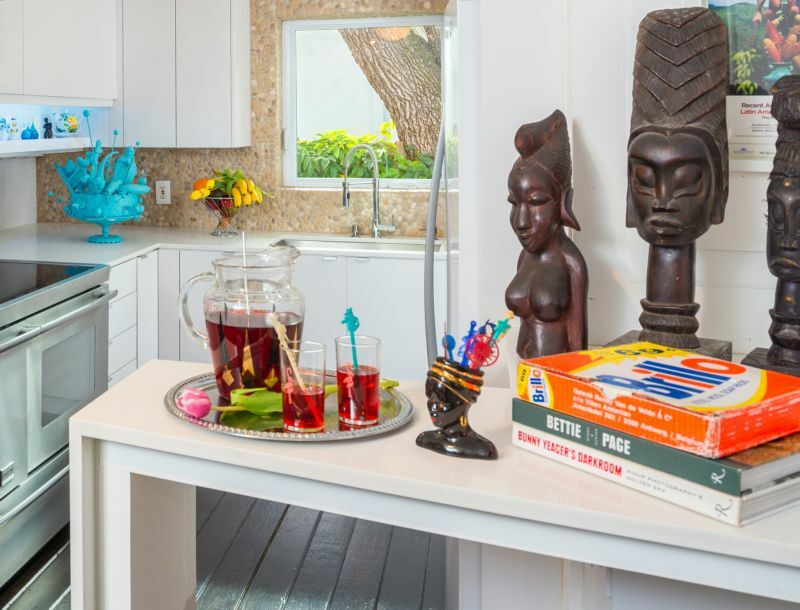 A previous owner added a large master bedroom and bath to the existing two bedroom, one bath home and demolished some walls, but Latorre took it further. 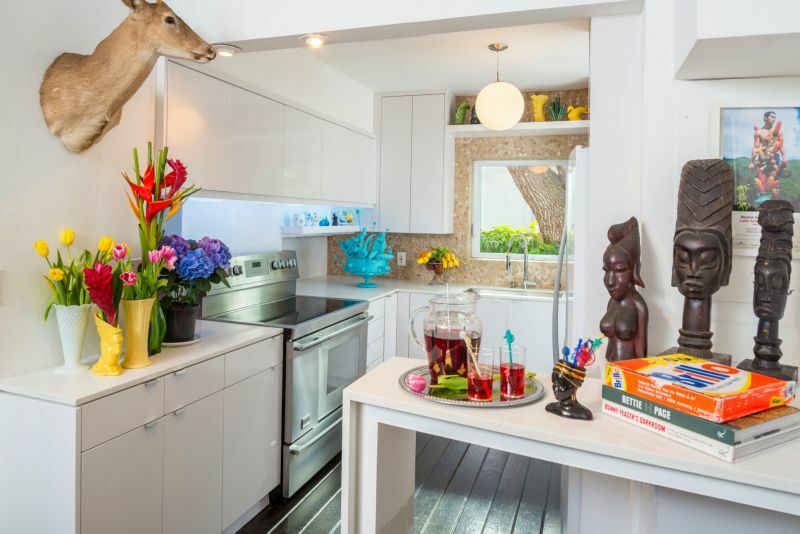 He reconfigured the kitchen, expanding it into the dining area, adding a breakfast bar and pushing it out into the side yard, doubling its size to add a pantry and laundry room. The two smaller bedrooms serve as a studio and office and the former pass-through holds library shelves. 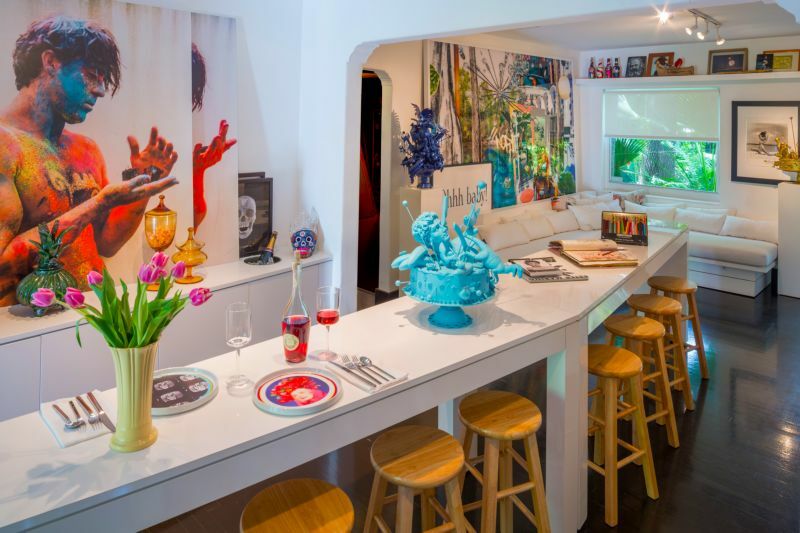 Blue Cake Atomic, 2011 (artwork collaboration between Carlos Betancourt and Alberto Latorre); majestic African wood carvings; a rare textbook of Andy Warhol Prints (Brillo) and vintage 1950s ceramics on the top shelf; the photograph on the wall is Sunday Afternoon in El Yunque by Betancourt. River rocks surround the window which was created to frame one of the oak trees on the property. 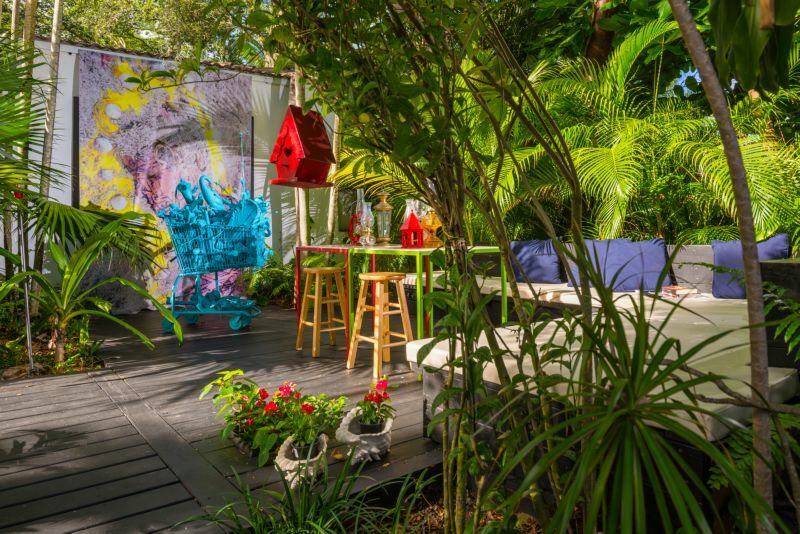 An outdoor deck and lounge, which Betancourt and Latorre built themselves in the front yard, extended the entertainment area and cocktails are usually served there under swaying palm trees. “Because of how we entertain there had to be an easy flow from the moment guests come in,” explains Latorre. The exterior was just as important as the interior. Surrounded by century-old, massive oaks, different layers of vegetation were added, with ferns at ground level, then bushes and tall hedges. 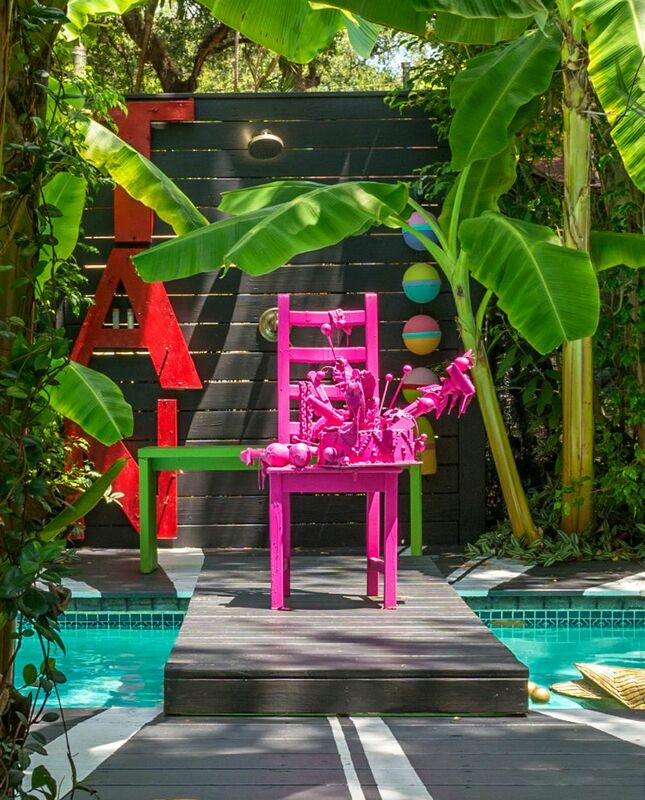 “Not manicured, we wanted that wild, natural feeling,” he emphasizes. A variety of palms, Kapoks and Gumbo Limbo trees were mixed in along the perimeter of the property, along with Ficus, Papyrus, Bamboo and Banana trees to border the pool. 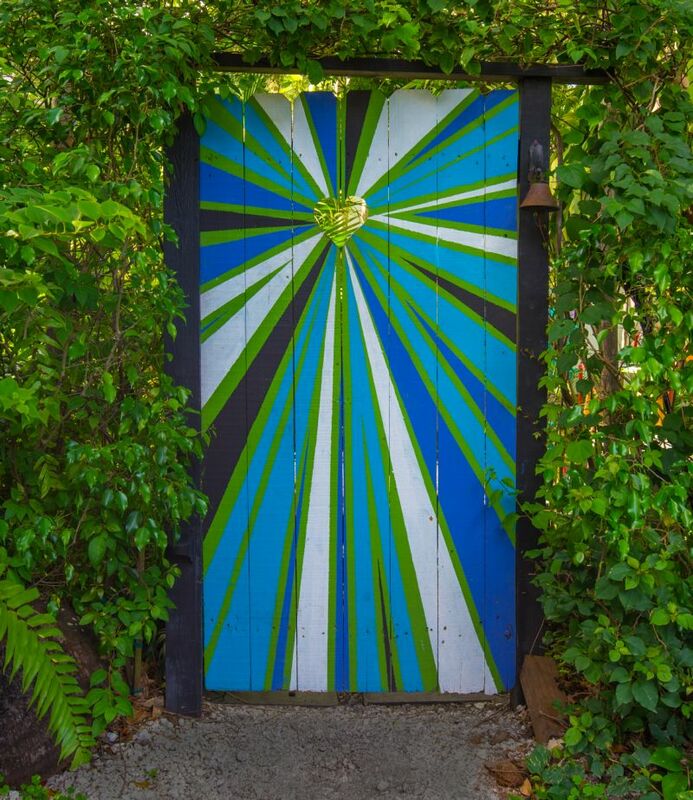 The cheerful front gate designed by Latorre, foreshadows the pool terrace’s radiating stripes. Cleverly angled tables designed by Latorre can be positioned end to end for a seated dinner for 18 or pushed together as drafting tables with hidden drawers that store supplies. Wooden stools tuck neatly out of the way. The angled buffet cabinet features a built-in champagne bucket. The large work behind the sofa is El Portal I, 2011 by Betancourt; Ohhh Baby is by Dan Cole; the metallic blue sculpture is Of Things Past, How Much I Love You II, 2012 by Betancourt; the work of various artists is displayed on the shelf above the custom-made sofas, designed by Latorre. The dining room buffet is topped with gleaming, white quartz as are the kitchen counters and living room cabinets, which reflect light and expand the space visually. The fireplace mantel is also angled and deceptively-shallow wall shelves add dimension without bulk. They were carried into the kitchen and other rooms as an ever-evolving gallery. 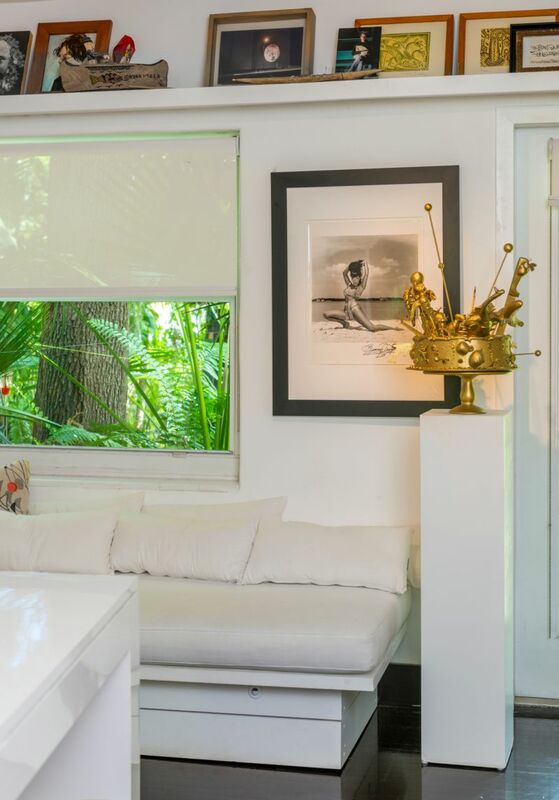 Crisp, white walls were de rigueur since Betancourt’s colorful art, as well as other artists’ work they collect, is displayed throughout. The built-in sofas are covered in a nubby linen and the streamlined bases provide even more storage. “Elements I’ve used are informed by neo-futuristic architects of the 1950s, Eero Saarinen and Morris Lapidus,” explains Latorre. “Their architecture was joyful and optimistic.” Polished black floors add depth and sophistication. “The glossy, dark floors in the house bring to mind the shimmering surface of ponds and rain,” he says. 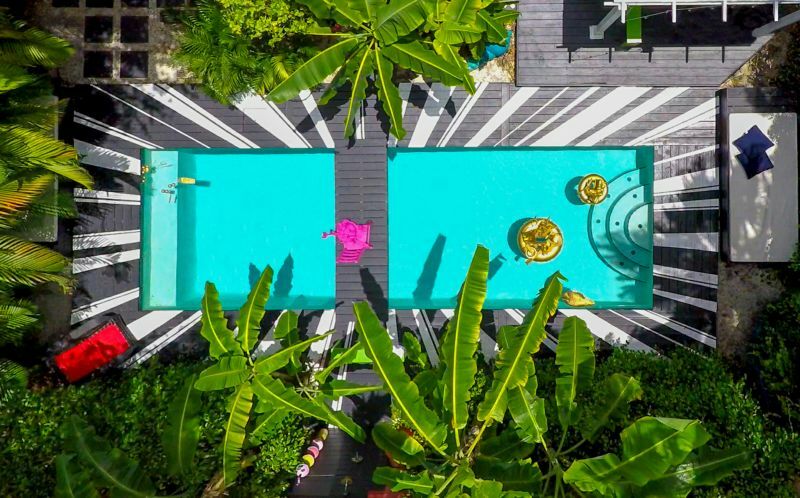 An aerial view of the pool and the lush vegetation that surrounds it. On the pool terrace, an unconventional, or some would say, outrageous, design decision was put into play. Latorre wanted a smooth flow to the exterior, so black matte paint was chosen for the wood deck surrounding the pool, the small bridge, the pavers and benches. River rocks the color of charcoal were added for texture. “It allows for the transition so the colors of nature stand out, since the greenery is so strong,” he states. 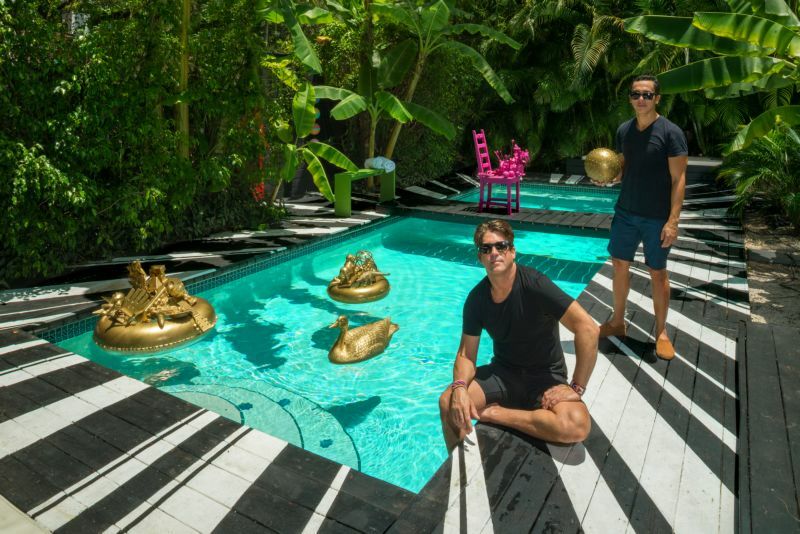 The showstopper, unveiled during the Miami Beach Art Basel Studio Visit program, was the next phase; the black and white explosion of radiating stripes surrounding the pool. The way the light penetrated throughout the house provided inspiration says Latorre. “I was also inspired by the explosions of the Re-Collections series,” he says of Betancourt’s work. “It’s also an evolution of what happens at the front gate.” To achieve the pattern on the pool deck, the center point of the pool was marked off with a string and the two DIYers drew lines with chalk and long pieces of wood, then painted the entire design themselves. “That controlled the geometry, but there’s a studied randomness, since some lines are wider than others,” says Latorre.